Take a fun-filled, imaginary journey around the world, in space, and in your imagination with Capital Ringers as they ring classics, “What a Wonderful World”, “Overture from the Barber of Seville”, “Fly Me to the Moon”, and “Pirates of the Caribbean”. Bring your family and friends for a concert of Seuss-style surprises! Capital Ringers is renowned in and beyond Delmarva for their vast repertoire including classic rock, jazz, patriotic, sacred, top 40 tunes, and traditional holiday favorites performed on the largest set of handbells and handchimes on Delmarva. Capital Ringers, Inc. is a 501 (c) (3) community English handbell ensemble. 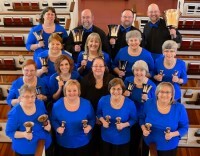 Founded in 2004 by Artistic Director, Linda Simms, this group delivers performances that demonstrate the artistic diversity of English handbells and handchimes. -Saturday April 13 @ 3pm: Westminster Presbyterian Church, 301 King Charles Ave., Rehoboth Beach DE. -Saturday April 13 @ 7pm: St. Martha's Episcopal Church, 117 Maplewood St., Bethany Beach DE. -Saturday April 27 @3pm: Mariner's Bethel United Methodist Church, 81 Central Ave., Ocean View DE. -Saturday April 27 @ 7pm: Long Neck United Methodist Church, 32051 Long Neck Rd., Millsboro DE. -Sunday April 28 @4pm: Zion United Methodist Church ,612 Locust St., Cambridge MD. -Saturday May 4 @ 3pm: Centenary United Methodist Church, 200 W. Market St., Laurel DE. -Saturday May 4 @ 7pm: Reformation Lutheran Church, 613 Lakeview Ave., Milford DE. -Sunday May 5 @ 4pm: Conley's United Methodist Church, 33106 Jolyns Way, Lewes DE.